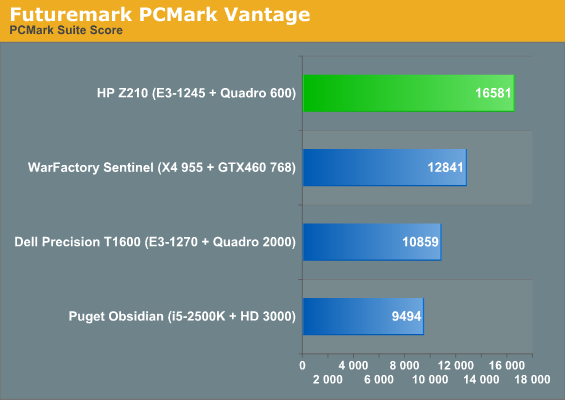 Unfortunately even in the business sector we're not fully able to escape from under Futuremark's shadow, but the SSD in our review unit should give the HP Z210 SFF some breathing room, and the Sandy Bridge architecture underpinning the Xeon E3-1245 will help tremendously. In our review of the Dell Precision T1600, their representatives took issue and rightfully so at our inclusion of benchmarks from overclocked gaming desktops in our comparison. 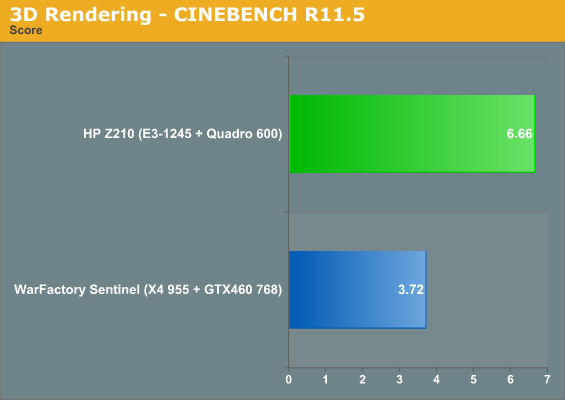 That's one area where this review will diverge; we're including only benchmarks from non-overclocked machines. It goes a long way towards narrowing down our results, but hopefully we'll get more workstations on hand in the future and build up a solid collection of data. 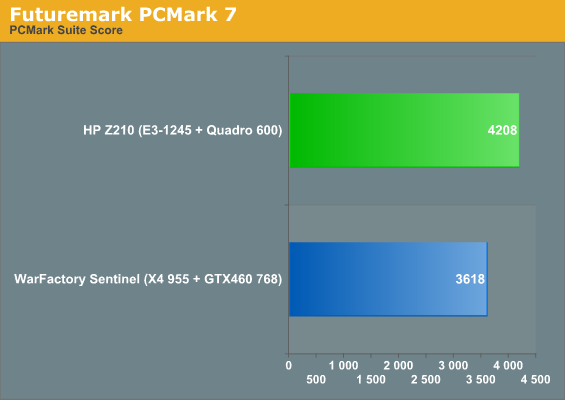 PCMark always skews heavily towards SSDs, so despite the Dell Precision T1600 having a faster processor and video card than the HP Z210, it still winds up losing in our PCMark tests. That's not really inaccurate as a representation of system usefulness, though, since the SSD will make a far more noticeable impact in overall responsiveness than a slightly higher CPU clock (unless you happen to run CPU-intensive workloads most of the time). 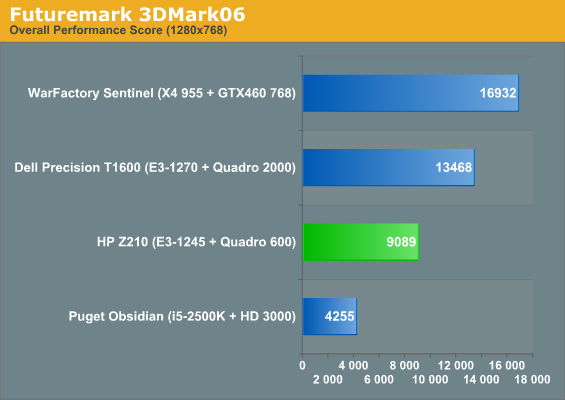 As for the 3DMarks, we mainly use those scores to demonstrate that these aren't gaming graphics cards but do hold an appreciable performance advantage over Intel's integrated graphics. 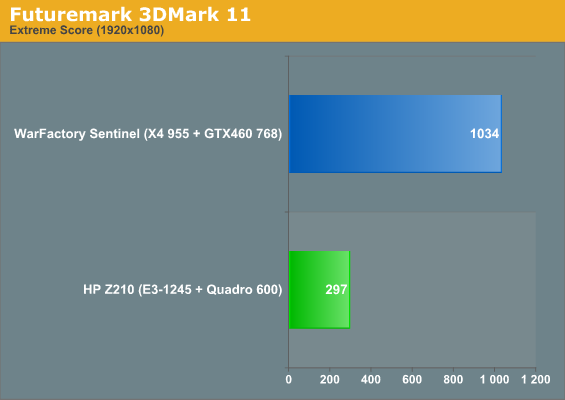 When we get to the proper application benchmarks, a couple of points immediately surface. 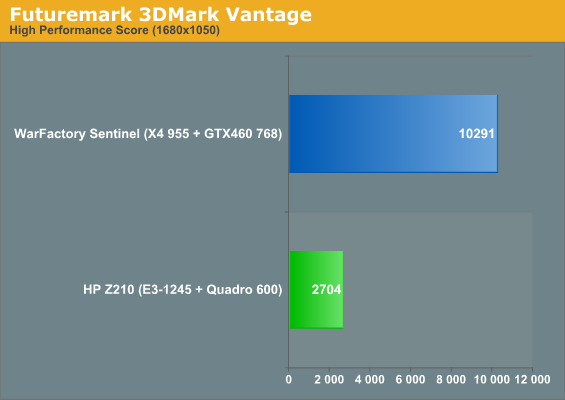 First, the 100MHz clock speed difference between the E3-1245 and E3-1270 is wholly unremarkable. Second, the second pass on the x264 encoding benchmark sees the Core i5-2500K taking a substantial dive behind the identically-clocked Xeon E3-1245; perhaps the extra 2MB of L3 cache is paying off dividends here, or Hyper-Threading is playing a role. Third, AMD desperately needs Bulldozer. If the performance of the Phenom II X4 955 in the WarFactory Sentinel is any indication of how current Opterons are doing, AMD needs a much faster processor to get a bigger slice of that sweet, sweet enterprise market mark-up. Well a few things, here. 1. This is just one of a whole slew of HP products that have been reviewed in the last few days... but HP is abandoning the PC business... so why are we bothering again? 2. 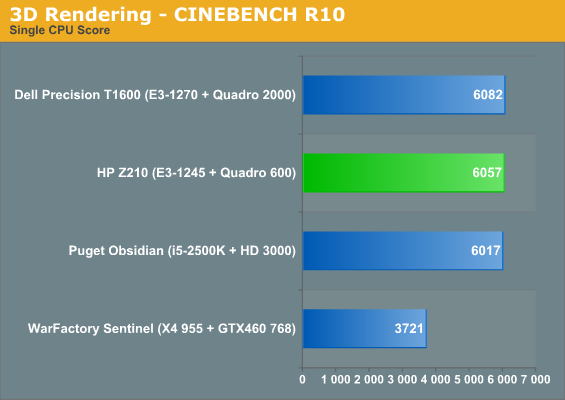 OpenGL drivers from Nvidia and AMD are both embarassingly piss-poor for consumer cards in the Windows world, and gamers don't seem to care. 1. They're backtracking on that, and until they actually DO abandon the PC business there's no reason to stop reviewing their stuff since it's out there and in force. On top of that, I'm pretty sure two units don't count as a "whole slew." 2. 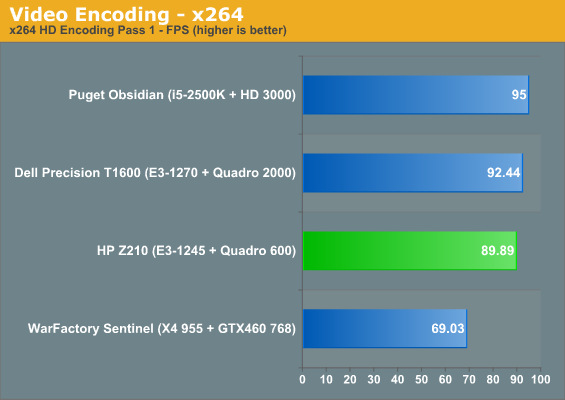 OpenGL drivers from NVIDIA and AMD are adequate for consumer cards and gamers in Windows. Not spectacular, but Quake Wars doesn't run terribly and honestly, consumers don't run very many heavy duty OpenGL apps. To go with what Dustin has said, HP is looking to *sell* their consumer business off to another company, not "abandon" it entirely. Just like IBM ditched their laptops and PCs and Lenovo bought them, there would likely be a taker for the current #1 worldwide computer business. ... and why would any company ditch products with margins like this?! $499 laptops at Best Buy make zero profit and would not be missed. This is a commercial line product. Big corporations cannot and should not spend time building PCs with parts from NewEgg. They need the service, warranty, and reliability provided by big vendors so that they can focus on their core businesses. So, just because you think you can build something similar to this, it does not mean this article is irrelevant to readers other than you. Support on the hardware, onsite is important on this kind of systems. Along those lines, my experience with both Dell and HP are that the service on the workstation-class commercial systems is excellent, whereas the service on consumer systems is, uh, wanting. I thought I hated Dell, but my T3500 workstation has been a rock and when I had some issues with adding a RAID controller, they solved my problem in 5 minutes.